Compiled by Brian T. Thornalley, for the Willoughby web-site. • 'The History of Willoughby on the Wolds' by Heather Hamilton (Nottingham Univ. 1970). 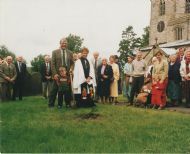 On Sunday 17th September 2000, after the Harvest festival Service, a 'Yew for the Millennium' was planted in St. Mary and All Saints Church yard. This tiny plant was propagated from the Buxted Yew, East Sussex. 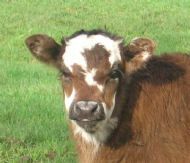 as were very many others made available to all Parishes in the Country by The Conservation Foundation. The Buxted yew is estimated to be at least 2000 years old, and can be found about half way between Brighton and Tunbridge Wells. The Willoughby Yew was planted, under Revd. Christine Turner's supervision and Blessing, by Brian Thornalley and his grandson Joshua, and was witnessed by the congregation attending the Harvest Festival. Contrary to modern associations (eg. graveyards), in ancient times the yew tree (taxus baccata) was known as 'the tree of life', mainly for its unfailing ability to regenerate after severe pruning and lopping. The long, thin, side branches were the source of wood for making the famous English long-bows. Most parts of the tree are poisonous to humans, though not so to 9 species of mammals, nor to 9 species of birds. 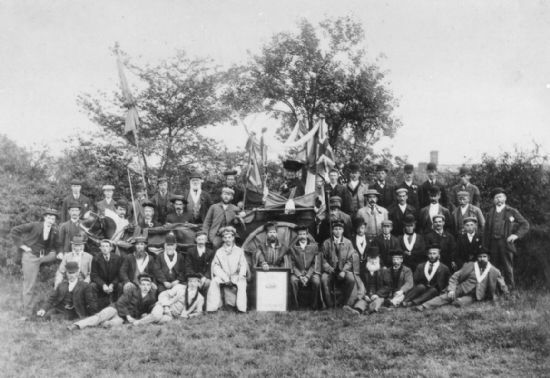 Front (on ground) : G. Cooper, J. Watson, S. Screaton Jnr., J. Screaton (Treasurer), T. Screaton, F. Watson (Steward), S. Harding (Warden). H. Finch, A. Goodacre (Vice Grand), W. Marshall (Tyler), J. Hallam Jnr., M. Green, W Goodacre, A. Sleigh, H. Smith. Row 3 (standing): J. Sketchley, T. Sketchley, A. Cross, T. Dalby (Steward), W. Cross (Secretary), J. Harding, J. Tuckwood (half-hidden), J. Hallam, J. Cross, T. Hornbuckle, J. 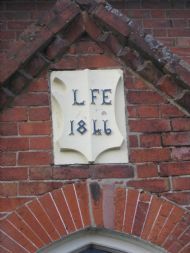 Lane, T. Marriott, H. Wadkin. A. Matthews, F. Hallam, W. Skinner, J. Marriott Snr. Note: The horse is not named !